Serial memory programmer with USB interface for EEPROM, FRAM and FLASH devices (I2C/IIC, SPI and MICROWIRE/uWire chips from 24... 25... 45... 93... 95... series). ICSP programming. Compatible with 1.5-5.0V chips. Power supply and communication via USB 2.0. Full product description, software and user manuals can be found in Products -> REVELPROG-IS. for automotive & car electronics service we recommend REVELPROG-IS (built-in SOIC-8 150mil adapter will be used very often in instrument clusters, airbags, radio code and other modules) + optional CLIP SOIC-8 for incircuit programming (without desoldering eeprom/flash). Adapter SOIC-8 200mil will be used rarely (e.g. in BOSCH injection pumps, navigations, climatronic modules). Adapter TSSOP-8 is used for some airbag and ecu modules (e.g. for 95x series microwire eeproms). Adapters QFN-8 and WSON-8 are not useful in car electronics. for computer / notebook service and data recovery we recommend REVELPROG-IS (built-in SOIC-8 150mil will be useful in some cases for bios/firmware reflash) + adapter SOIC-8 200mil (used very often for BIOS / firmware storage) + optional CLIP SOIC-8. Adapters QFN-8 and WSON-8 may be useful in latest notebooks from Apple, HP, Dell (MY 2015+), but these devices are still used quite rarely. for RTV/AGD service and consumer devices service we recommend REVELPROG-IS (built-in SOIC-8 150mil adapter will be used very often) + SOIC-8 200mil (often used for firmware storage) + optional CLIP SOIC-8 and adapter SOIC-16 (sometimes device firmware). Adapters QFN-8, WSON-8 may be useful in latest TV and high-end consumer devices, but these devices are still used quite rarely. for telecommunciation technican and network service we recommend REVELPROG-IS + adapter for SFP/SFP+ fiber/ethernet modules. Maniek · 27 days ago. REVELTRONICSProszę zwrócić uwagę że programator obsługuje pamięci na różne napięcia (ustawialne od 1.0V do 5.0V) i niestety ale kontakt styków jest nie do zrealizowania przy tej funkcjonalności. Tylko w programatorze na stałe napięcie (np. 3.3V). Sławomir · 1 months ago. amichalecki · 4 months ago. azli fakhri · 5 months ago. very useful, more easier rather than open source programmer. Thank You revelprog. Joaquim Silva Alves · 5 months ago. I install a the new version 1.8 in windows 10 but it dont open and 1.7 version dont let me work . what can i do to solve this probem ?? REVELTRONICSHello. Review system is not for suppot so I wrote you email. We'll help you via email. Please check your inbox. Jamesyong97 · 6 months ago. It works! Thanks Reveltronics, i will buy one more for stock. Alex · 7 months ago. Ich nutze den Programmer unter Win 10. Keine Probleme, funktioniert super. Einer der unproblematischen SPI FLASH Programmer in meinem Haushalt. 3.3v und 1.8v werden unterstützt. Schnell geliefert. Danke dafür! Sylwester · 7 months ago. Marek · 8 months ago. Maurice Onraet · 8 months ago. 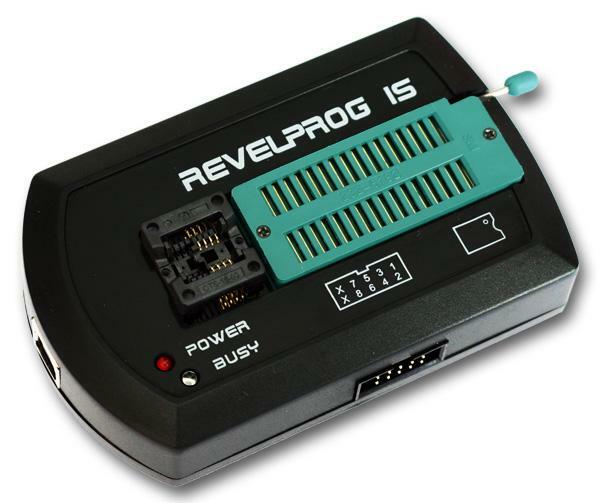 As an automotive locksmith I find the REVELPROG-IS the earliest to use and most versital eeprom programmer on the market. Every locksmith should carry on on their truck. Thanks so much. JamesyongCan this tools read and write scania trucks ecu engine and coordinator?